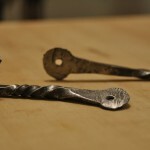 Recently, I’ve started playing around a bit with metal-working. Pretty low-tech stuff – heat it and beat it. My DIY coal forge isn’t much to look at, just a couple pieces of steel pipe with the shop-vac on a dimmer switch, and an old brake disc welded on top, but it’s enough to do some basic blacksmithing. 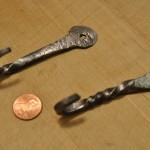 Last night after work, I fired up the mini-forge and worked on a pair of old iron nails. I heated them, and then applied a blacksmith twist, a bend to make a hook, and even hot-punched (NOT drilled) mounting holes. Once done, I hit them with a wire wheel to give it that shiny silver-and-black finish I like. 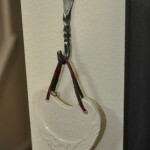 The result is a pair of decorative, yet very functional, iron hooks for hanging decorations, photos, and the like. 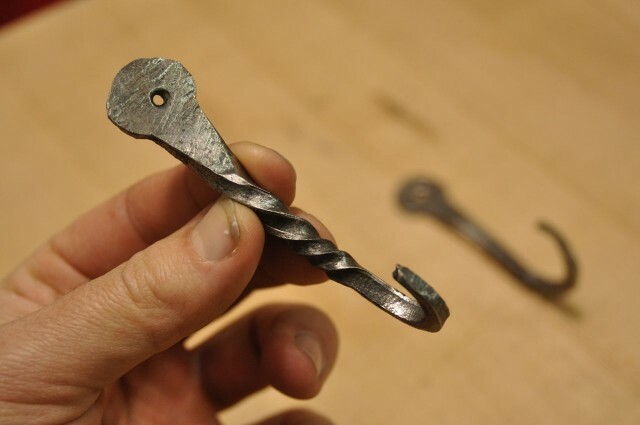 Maybe I can make a few more to mount next to my wood stove to hold my fire poker and kindling hatchet. 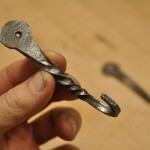 This entry was posted in metalworking, Uncategorized and tagged blacksmithing, hooks, metal-working, nails. Bookmark the permalink. Nice! Did you coat them with polyurethane or anything to prevent rust? I thought I would hit them with a spray on clear-coat.